Of the three leads in Batman v Superman—Henry Cavill, Ben Affleck, and Gal Godot—who was the easiest to shoot? It’s hard to say. Gal is so beautiful and strong and awesome. She’s a ton of fun and she’s new to the genre of superhero films. But then Henry is the spitting image of the Superman that you have in your head. It’s crazy. 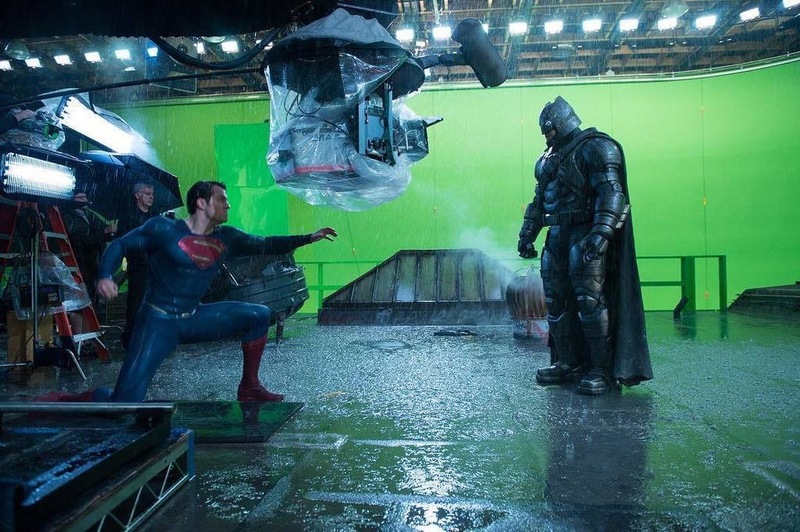 When he’s got his cape on and he’s in full costume, you’re shooting Superman. The only other male icon that’s in your head for your whole life is Santa Claus. And then Batman is a giant, hulking awesomeness of dark who presents challenges because his costume is dark. He’s also so awesome that you let it go. On some level it’s just a chin for Ben as Batman. But what a chin it is. Warner Bros. also set dates for two of its now-untitled DC films: Oct. 5, 2018, and Nov. 1, 2019. These new dates are set for yet-to-be announced films and are in addition to the already dated DC films, which include Suicide Squad (Aug. 5, 2016), The Flash (March 16, 2018), The Justice League Part One (Nov. 17, 2017), Aquaman (July 27, 2018), Shazam! (April 5, 2019), Justice League Part Two (June 14, 2019), Cyborg(April 3, 2020) and Green Lantern Corps (June 19, 2020). Since we just found out that Zack and Henry are still very much looking forward to Man of Steel 2 happening down the road, we are really hoping one of those slots belongs to the film. Go Supes! Momoa will be back in that "s**t" soon, as cameras start rolling on the first Justice League movie next week. What he looks forward to most about teaming up with Batman (Ben Affleck), Superman (Henry Cavill) and Wonder Woman (Gal Gadot) onscreen won't surprise you -- it's the action. "I like fighting. So, I'm looking forward to being a superhero and just fighting," he teases. You said you would like to play Lex Luthor again. Is that in place yet, or is it up in the air? I have an ankle bracelet on that's connected to the Warner Brothers precinct, so forgive me for being evasive. Hmm.. we have a feeling Lex is not gone for good. As for Supes, Blastr seems to know where he'll end up in this next installment. Not even gonna lie: We're all for the Superman heroics, but bring on the dark and moody! (at least for a little bit). So far we are loving Henry's development of the character, and we can't wait to see where it will lead next. In the meantime, we'll be in the theater watching Batman v Superman for the 5th.. or is it the 10th time? -- DO NOT miss it in IMAX. Oh yay!!!! More Supes! More Supes! I can't wait! I hope one of those mystery dates are for MOS2 how amazing would that be!!! Have fun filming JL Henry and crew! And i'lm going for the 4th time to see BvS on Saturday! Can't wait!!!!! Yes, see it in IMAX. It makes a huge difference. Hope when Momoa said there are some great battles this includes Superman! We've not seen him really show what he can really do. I'm looking forward to seeing JL come together. MORE HENRY!!!!!!!!!!!!!!!!!! I'm tired of Superman being used as a device for bad! BvS was painful to watch as Clark was broken! I want him to be good! No more bad Kal-el start showing him in a good light! He's a hero to many. NO NO NO! enough of bad SUPERMAN! :( my kids love superman and have done for many years! I too agree that Superman is about hope and love. I really want Clark to become the hero of the story. When he comes back fine he might have forgotten a few things but for him to be even more bad would break my heart! If someone can contact Zack and pled with him to make superman all good I would be happy. I agree, At the end of BvS supes became the hero risked his life for everyone. To come back worse and bad would be heartbreaking. Superman stands for Truth, Justice and the American way. His symbol means HOPE. he's about helping and believes in mankind that there are some good people out there. I would hate to see him alienate himself once again where people don't trust him. NO MORE BAD SUPERMAN. To be honest I am fed up with Superman being so upset, angry, annoyed and so unsure of himself. I get it that he's still in that discovery stage and still finding himself but that has to stop! Superman is about giving people hope. Yes he maybe superhuman but that doesn't mean he has to be bad. Give the fans what they want Mr Snyder, I understand that all heros will struggle and face trials but In MOS he was lost! in BvS he was beaten physically and Mentally. The only option is up from here please... Don't create a bad superman he's alienated enough it's time we embrace the hero he is. IDK does Mr Snyder like Superman? I'm getting the vibe he love Bats more.